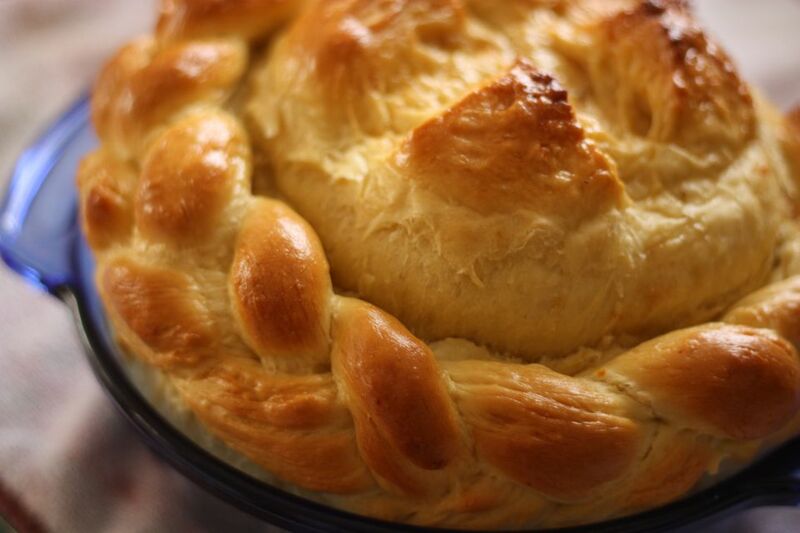 This recipe for Slovak Easter bread or paska (PAH-skah) is made into round loaves decorated with religious symbols made of dough. The dough used in this recipe also can be used to make paska peeps—small, chick-shaped dinner rolls. Grease three (7x3-inch) round bread pans and set aside. In a small saucepan, heat 2 cups milk, 1/2 cup sugar, salt, and butter over low heat until butter melts and sugar dissolves. Cool to lukewarm (no hotter than 110 F) and set aside. Dissolve yeast and 1 tablespoon sugar in warm water placed in a mixing bowl or stand mixer bowl that has been warmed. Let proof for 5 minutes. Add eggs, reserved milk mixture, and 4 1/2 cups of the flour. With the dough hook attachment, mix on speed 2 for 1 minute. Continue mixing on speed 2, and add remaining flour 1/2 cup at a time and mix about 2 minutes or until dough clings to hook and cleans sides of the bowl. Continue mixing 2 minutes longer or until dough is smooth and elastic. It will be sticky to the touch. Place dough in greased bowl, turning to grease top. Cover and let rise in warm place about 1 to 2 hours or until doubled. Punch down dough and divide into thirds, reserving a small piece of dough from each to make decorations. Shape each third piece of dough into a round loaf in the prepared pans. Using reserved dough, decorate with a cross in center or braids around the edge. Cover and let rise in warm place 1 to 2 hours or until doubled. Gently brush tops of risen dough with milk or beaten egg yolk. Bake 40 minutes or until golden brown and an instant-read thermometer registers 190 F.
Remove from pans immediately and cool on wire rack. Serve during your Easter dinner and enjoy! An alternate way of using this dough is to form it into little bird-shaped rolls known as Peeps. Follow the recipe above up to the first rising. After dough has risen the first time, portion out 1/8 cup dough for each peep. Let rest, covered, a few minutes. Roll each portion into a 10-inch rope. Form a knot with a short end sticking out for the head and the long end of the tail. Position the knot so that it looks like wings sticking up and the head is in an upright position. Tweak the head to shape a beak and embed cloves (cut off the stem end) or 1/6 of a raisin for the eyes. Place on greased cookie sheet. Flatten long end a bit and make 3 to 4 slashes on it, being careful NOT to cut completely through the dough, to give the appearance of tail feathers. Cover and let rise for 20 minutes. Brush with milk or egg yolk and bake at 350 F for 15 minutes or until golden brown.